Welcome to the Behavioral Biometrics World. BioCatch's behavioral biometrics detects online threats and stops financial fraud. Here you can get the latest news and trends on continuous authentication, online users, fraudsters, and malware. One-time Passwords: What are the Alternatives? One-time passwords (OTP) remain one of the most widely used forms of two-factor authentication, despite their well-documented vulnerabilities. Earlier this year, a major UK bank was hit by an attack in which fraudsters diverted text messages from legitimate customers’ phones in order to bypass two-factor authentication and access accounts. While this attack worked through a hole in telco network protocols, more common ways to bypass OTP-based security include porting a mobile number to a new SIM card through social engineering at the network operator, adding a new phone number to a bank account by impersonation on a call to the bank, mobile malware, and a host of man-in-the-middle attacks. Besides the fraud, users find OTPs extremely cumbersome, seriously hindering banks’ efforts to craft exceptional user experiences on the mobile and online channels. Yet, customer experience is most important differentiator to attract new users and improve customer loyalty. Convenience, simplicity and speed are the new standard. So where does that leave OTPs and what are the alternatives? 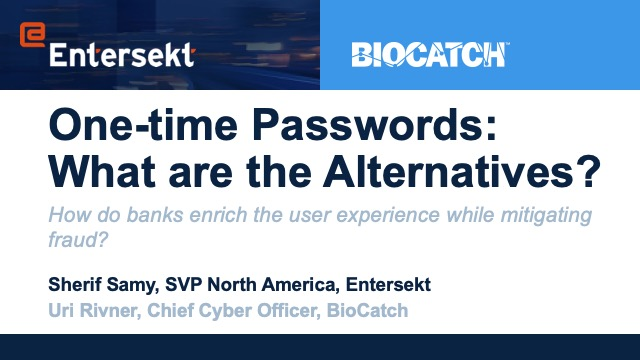 Join Karen Webster, Managing Editor of PYMNTS.com, on May 6 at 11:00 EDT as she talks to Sherif Samy, SVP North America at, Entersekt, and Uri Rivner, Chief Cyber Officer of BioCatch, about on the real cost of OTPs, in fraud and user friction. We will also explore winning mobile alternatives to OTPs, like behavioral biometrics coupled with advanced mobile app security. Vishing costs British banking customers millions of pounds every year and has become the fastest growing scam in the United Kingdom, but the risk is not limited to that country. In a typical vishing fraud case, the criminal dupes his/her victims into performing financial transactions. For example, a fraudster may call the victim disguised as a security official from his or her bank and, after establishing trust, coerce the victim into transferring funds from his or her account into the scammer’s account as a ‘security measure.’ This voice-based, social engineering crime is only growing in popularity and is set to cost banking customers even more money in the coming years. Join us on February 27th at 11 AM as Uri Rivner, cybersecurity veteran and Head of Cyber Strategy for BioCatch as he examines why this con is growing so rapidly and discusses how BioCatch’s newest offering combats the rising vishing epidemic. Using patented, advanced data science and AI techniques, BioCatch analyzes the user’s online interactions in real time and generates powerful insights. Among these insights are indicators that suggest a person is conducting a transaction under the influence of a fraudster. Traditional fraud detection measures do not work in this instance – the real person is logging in from their own device at the correct location conducting a fully authorised transfer. Nonetheless, by analysing more than 2,000 potential behavioural parameters in real time that does not disrupt the user journey, BioCatch can discern whether or not a person is being directed by a fraudster. 2018 seemed a dismal year for cybersecurity and identity. Massive data breaches, new forms of malware and increasingly sophisticated social engineering attacks hit businesses and consumers at a steady pace. This pace does not seem to be slowing down. Can we expect any better in 2019? In this webinar, BioCatch’s Chief Cyber Officer, Uri Rivner, will examine the top trends he sees happening in the industry in 2019. Uri has been fighting cybercrime for over 15 years, during which he lived through massive changes in the payments and banking industries. With faster payments now taking hold in Canada and the US, legislative changes coming to help thwart the rise of synthetic identity, large organizations making moves around passwordless authentication, artificial intelligence driving many more backend decision making processes and more, it is clear that 2019 will bring many new opportunities and challenges. Join us as Uri presents his predictions for what this means for financial institutions, global enterprises and digital identity at large. The paradigm for identity risk management and authentication is changing. In the new paradigm, context and data available for a specific type of interaction must drive analytics. Instead of just looking for commonality, we need to make better use of data that is unique. - Consumer/business interactions vary widely in terms of the amount of data they provide to drive risk assessment. - The amount and range of data available to assess identity risk is now so rich and varied across interactions that the analytical approach must also change. Frictionless authentication: The “passive” use case focuses provides a completely frictionless experience for the end user, while thoroughly authenticating the user’s identity as a background process; usually requires a higher level of confidence driven by the transaction value. -Built around the use of passive authentication methods, especially behavioral biometrics(BioCatch), and device intelligence using Danal and FraudNet. - New, unique data and a new approach to analytics and machine learning to make informed identity decisions to the right level of confidence. Fraudsters are ever-evolving and constantly discovering new methods of stealing money from institutions worldwide. The drive to digital transformation is providing new opportunities for fraudsters to exploit businesses and consumers remotely. The losses from cybercrime continue to rise year-after-year with the number of cyber incidents targeting businesses nearly doubling between 2016 and 2017 according to the Online Trust Alliance. 2018 is not showing any reduction in these trends. How should businesses balance risk against Information Security costs and investments? What is the true ROI of fraud investments? Join us as Leif Easterson, former CFO, Information Security and Risk Management at Citigroup, examines these issues and more. Using experience from his days at Citigroup, where these were challenges that he faced on a daily basis, Leif will examine the true cost of fraud to financial institutions - both the actual fraud and the operational costs associated with fraud and risk managements. Additionally, BioCatch will be unveiling a new ROI calculator to help companies determine what the impact of next generation solutions like behavioral biometrics to the bottom line. The world of payments is rapidly-changing. The rise of P2P payments in the U.S, Canada and Australia along with dramatic regulatory changes in Europe (PSD2), has created new opportunities across the ecosystem. New third-party payment providers (TPP​'​s) in the EU and P2P apps in other regions are entering th​e arena​​​ by supporting the rapid rise in demand and associated adoption rates. Banks are enabling direct access to accounts via APIs. Consumers now get to pick which apps they use, how they want to pay, and when, making the user experience paramount to win their loyalty. At the same time, however, the speed and “openness” makes the ecosystem vulnerable to several types of threats including malware, social engineering, remote access Trojans, SIM swapping, call forwarding and other techniques. Using these techniques, the fraudsters are able to exploit various points of potential weakness: at the account creation stage, the bank account linking process and payment authentication. Join us as Iain Swaine, explores this fast-changing landscape, leveraging real world experience that stems from his days as eCrime Fraud Prevention Manager of the Royal Bank of Scotland, which was on the front lines of the initial faster payments adoption in the UK, and his current work as Head of Cyber Strategy, EMEA at BioCatch. He will explain how fraudsters see the this new world, what some of their techniques are and some of the techniques that are being used by leading enterprises around the world to address the risks in the P2P and PSD2 ecosystems. As account opening continues to transition from physical to digital channels, financial institutions, issuers, lenders, and other organizations must optimize the digital experience of applicants in order to compete. At the same time, fraud is on the rise as criminals have become more successful than ever, thanks to some of the same digital channel benefits enjoyed by consumers: convenience, speed, and ease of use. To achieve the necessary balance between preventing fraud and providing a delightful experience for consumers, an approach to identity proofing that accounts for the channel, product, customer, and threat environment is absolutely critical. But regardless of the approach, inconspicuous solutions — like those based on applicant behavior — have a distinct role to play in how institutions manage the risk of application fraud. Watch a live demo of how BioCatch builds user profiles based on behavior to detect fraud in online apps. New account fraud is usually the gateway to many other criminal activities and is a growing concern for businesses that processes transactions online. Behavioral biometrics provides a new dimension to detect this type fraud by recognizing criminal behavior and being able to distinguish those behaviors from those of legitimate applicants, even if all the personal data entered into an online form is valid. Join us to learn how this is done. On November 8, 2017 FindBiometrics and Money20/20 presented the live webcast, "The Evolution of Money and Biometrics." Reporting on the heels of Money20/20, FindBiomerics President Peter O'Neill reviewed the biggest FinTech biometrics news out of the world’s premier financial conference, before handing the presentation to Maxine Most, Principal, Acuity Market Intelligence, who presented her firm's latest guidance. Acuity’s research set the stage for a dynamic discussion of biometrics and identity in the financial space featuring expert panelists: Bianca Lopes, Chief Identity Officer, BioConnect; Frances Zelazny, VP Marketing, BioCatch; and Sanjib Kalita, Chief Marketing Officer, Money20/20.